I know I am a day late, but I was so tired last night I just couldn’t write anything. Yesterday we went for a drive to the “Daintree Rainforest”. The Daintree Rainforest is located about 110 kms north of Cairns and is one of the world’s oldest and most beautiful rainforests. The wildlife of the Daintree is magnificent and second to none. It’s home to mammals found nowhere else in the world including species of tree kangaroo, rat kangaroo, ring-tailed possum, and ant echinus. The birdlife is even more remarkable with the crown going to the ‘relic’, the Cassowary. Related to the emus, rheas, kiwis and ostrich the Cassowary is now endangered. However it is found in the rainforest at Cooper Creek. Although I have been up this way a couple of times I am still yet to see one. The estuaries of this coastline are also home to one of Australia’s more dangerous reptiles, the saltwater crocodile. They are very difficult to see as they can stay under water for quite a while, and when it rains as yesterday was they tend to like to keep out of the weather. But we were lucky enough to see this 3 metre (approx. 9 feet) young male. This is the first time I had ever seen a crocodile in the wild and it was very exciting. Today we had a bit of a lazy day, but we did take the two dogs to the beach. It was Bosco’s (the pup) first beach experience and he wasn’t to sure about the sand or the waves. Unlike Mitch who loves the surf so much he just goes out and sits in the waves. The only problem with that is that this area is prone to crocodiles even in the ocean, so we had to keep a close eye on Mitch. watching him have fun with his dogs on the beach. Seen it all, but I am enjoying your fnq travels. 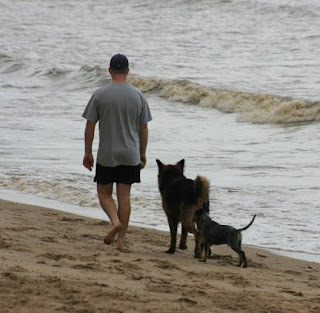 I just so would not let my dogs got into the sea water. Snap. That croc could do a lot of damage. It would keep me out of the water. It would probably keep me off the beach! I agree Andrew I was watching Mitch like a hawk. Susan there is no way in the world I would get anywhere near the water. YIKES, that's scary! Good to see you back again Davine, missed you yesterday.